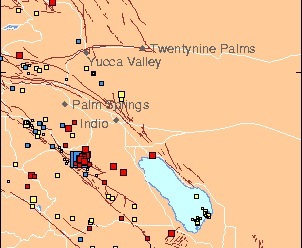 The U.S. Geological Survey's monitoring system places the epicenter in the desert near Anza, about 100 miles southeast of Los Angeles. It was felt sharply in the local area and also rolled through downtown Los Angeles, San Diego and in Orange County. Palms Springs police Sgt. Harvey Reed says the department has received no reports of damage or injuries. Monday also happens to be the two-year anniversary of the Tohoku earthquake off the coast of Japan that created a devastating tsunami and led to a major disaster at the Fukushima Daiichi nuclear plant.